Scalloped potatoese are also known as potatoes au gratin, which sounds a lot fancier than it really is...thinly sliced potatoes with a sauce and baked to form a crusty top. Some people add things to their scalloped potatoes like squash, spinach, cauliflower, anchovies, eggplant, mushrooms, fish, crab, cheese or breadcrumbs. 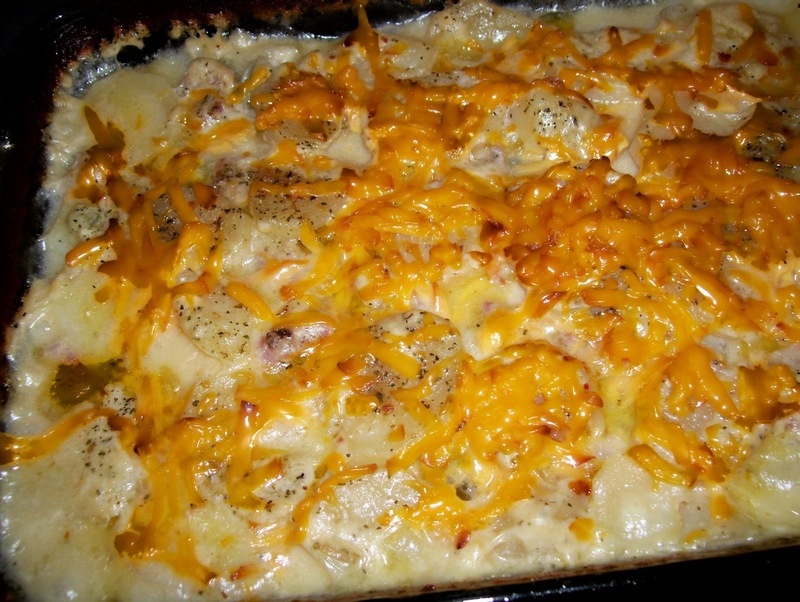 My mother always made scalloped potatoes a few days after we had had a baked ham for dinner. She would add pieces of wonderful ham to the layers of potatoes. 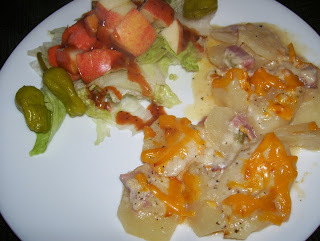 Because of this, I grew up thinking that scalloped potatoes were always served with ham. The vegetables and other foods listed above sound interesting, but I doubt that I will be putting anchovies in my scalloped potatoes any time soon! Besides being a great comfort food, scalloped potatoes can be made ahead of time, held in the refrigerator and baked when needed. I would invite anyone who loves potatoes and ham to try this lovely winter recipe. Melt 5 tablespoons of butter or margarine in a pot over low heat. Blend in flour and salt and pepper. Stir until mixture is smooth and bubbly. Remove from heat and whisk in milk a little at a time. Heat to boiling, stirring constantly. Boil and stir one minute. Set aside. Wash potatoes and remove skin. Cut potatoes into thin slices. In a greased 2-quart casserole or 13x9 pan, arrange potatoes in layers, topping each with onion, ham, (green pepper), and sauce. Top last layer with just potatoes and sauce. Dot with butter or margarine. (At this point, casserole may be covered and refrigerated until ready to bake). Cover with foil and bake at 350 degrees for 80 minutes or until potatoes tested with a fork are tender. Remove foil and sprinkle potatoes with shredded cheese. Return pan to oven and continue baking until cheese is melted and slightly browned. Remove pan from oven and allow to stand for 5-10 minutes before serving. Note: if you are not topping with cheese, remove foil as above and allow potatoes to brown slightly on top. Remove pan from oven and allow to stand for 5-10 minutes before serving. Note: To shorten cooking time, cover casserole with microwave safe plastic and cook on HIGH for 6 minutes. Remove and loosely cover casserole with foil and bake at 350 degrees for 40 minutes. If potatoes are almost tender, remove foil completely the last 20 minutes and continue baking. Let stand for 5-10 minutes before serving.